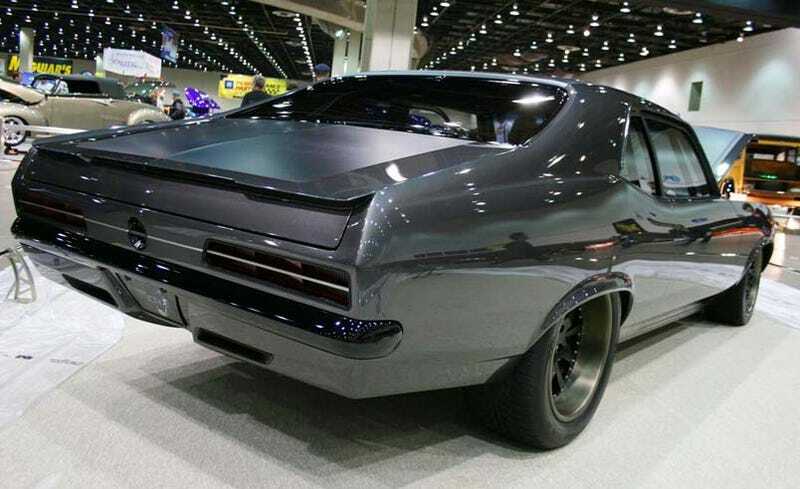 Troy Trepanier took a Chevy Nova, added a 572 cubic inch V8, a Procharger supercharger, blacked out everything and called it Notorious. This car will happily beat you up and take your lunch money. So let's get this out of the way: 572 cubic inch Procharged crate motor, 4L80E transmission, a 3.50 rear gear with a Detroit Locker, MSD ignition, 3" Flowmaster exhaust, Baer 14" brakes, and a RacePac Data Logger dash. This car will chew you up and not even bother spitting you out. It will do drag pulls so hard you children will feel it. Opec rejoices when this car visits a drag strip. All other Nova's feel inferior in the presence of Notorious. It's black, it's badass, and it makes us weak in the knees. Screw environmental stewardship, we'd rather be Notorious.